Commonly asked question: What are the differences between the different types of powdered milk? I apologize I wasn’t more clear in my posts last month. I taught a class on powd. milk and eggs last month, videoed the class and haven’t had a chance to edit it and post it on my blog. In my class I taught the differences between the two–sorry, I forget who I teach what to. NON-INSTANT POWDERED MILK: The cannery milk is non-instant powdered milk. This is the most healthy powdered milk you can buy. It is filled with vitamins and minerals and stores the longest on your shelf. This is the most important powdered milk to store because of it’s nutrients. If you purchase this milk at the cannery (or online) and it is sealed in a #10 can it will last over 30 years–the perfect option for long term storage. This milk is a little more difficult to find for purchase (if you don’t have an LDS Cannery near you–it will be worth your while and money to store this item in your storage, however you can get your hands on some). 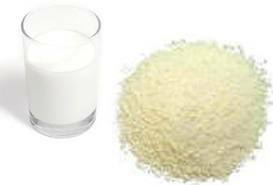 INSTANT POWDERED MILK: Instant powdered milk is non-instant powdered milk that has been altered so that it is easier to process. Think of instant or minute rice verses regular rice. This product is lighter and airier but not as healthy as non-instant powdered milk. It whips up into smooth milk a little more quickly, but other than that has no difference in flavor or texture. I can’t think of a reason why this milk is beneficial. It is also more expensive per ounce, so one more reason not to store it. MILK ALTERNATES: Morning Moo is a milk alternate and does not have the same nutrients of the non-instant milk. Think of it as real orange juice (cannery milk) verses tang (Morning Moo). The Morning Moo has things in it like hydrogenated oil and high fructose corn syrup. Two things that are not great for your body..but, that is what makes it taste better. This milk also doesn’t last as long as non-instant milk because it has the fat and oils in it. It will only last 2-5 years instead of the possible 30 years. One benefit to this milk is if you purchase this item on sale, it can be less expensive than the cannery milk (anywhere from .85-$1.25 per gallon). Which to store? I store both non-instant powdered milk and milk alternate for different reasons. I store the cannery milk (non-instant) for my cooking needs and for drinking if we had to live out of our storage for any reason (the nutrients are so much better). I store the Morning Moo if I want to supplement the milk in our fridge with a powdered version that tastes good and is less expensive. My kids can’t tell the difference between fresh milk and the Morning Moo (especially if I use half milk alternate and half fresh milk). Also..thanks from a reader who mentioned the recipe for S.O.S. Mix (Soup and Sauce Mix) from your powdered milk. There is no butter (like in the Magic Mix) and can be stored on your shelf. This seems like another fun way to use your powdered milk. When I try it I will give you my feedback 🙂 Visit this link for the recipe and tips on how to use this mix in your everyday cooking. I also got Macey's powdered milk, and it is really good. You might be interested to know that The Church of Jesus Christ of Latter-day Saints states on their Provident Living Website: "What kind of milk is best to store? Nonfat milk, either regular or instant, stores well when packaged properly and kept at room temperature or cooler. In the past, many felt that non-instant milk would store better. There is little difference in shelf life between instant and non-instant powdered milk." As a follow up to my above comment, I always encourage people to taste the different brands of milk before they store large quantities of it. Though the cannery milk is very cheap, my family dislikes the taste. Current processing methods result in very little difference in nutrition and storage life in non-instant and instant milks. Non-instant is cheaper but harder to mix. Instant costs more, but mixes and (to some) tastes better. It's a very individual decision. Hey! Do you have a trick you do for fixing milk for your toddlers who are supposed to be drinking whole milk? My family lives on strictly powdered milk (Honestly its probably been over a year so I've forgotten the woes of buying milk at the store) and it dawned on my that my little girl is turning 1 in a few days. I figure it needs added fats, just was curious if you have a trick for making the milk so you don't have a puddle of oil sitting at the top or something. I thought about adding yogurt, sour cream or something to that effect to add fat, but just wonder if you have a master flavor. Thanks. That is awesome that you live on powdered milk! I wish we could do that 😉 I have just heard you add more powdered milk per cup of water than making the original milk. That should give her the added fat she needs. I will have to google the ratios, I know they are out there. Sorry I am not more help. Good luck! Are there any options if you are lactose intollerant? This is how Deals to Meals began! This passion of mine has been an enormous blessing in our lives, as well as people all over the country. I have many passions in life; the most important ones being God and my family. A perfect day for me is being home with my family, hanging out in the kitchen, laughing, eating chocolate and enjoying great food. The kitchen is definitely the heart of our home and the place we grow the closest together. I love that I can share that with each of you. Sit back, put your feet up, and stay awhile. We are here to help make your life easier and teach you how to live on less, save money and have more time to do the things you really love. Our goal is to inspire you to live a more self reliant and fulfilling life. Saving money and making delicious meals doesn’t have to be hard. You’ll find recipes, meal planning tips, grocery deals, financial help, food storage ideas and ways to make your family better. Give our service a try! We’ll even give you FREE access for two weeks. That’s how confident we are that you’ll love what we have to offer. There is nothing to lose. If you don’t save, you don’t pay. Join us as we combine family, finances, food and fun into one place. Enjoy thousands of delicious recipes, shopping deals, financial advice, family fun and so much more! People all over the United States are using Deals to Meals to save hundreds of dollars every month on groceries... without using coupons. Learn to make healthy, homemade recipes. We'll simplify your meal plan to save you money and time. Sign up for a two week free trial! Grab a Button & Share! Love Deals to Meals and want to get paid to share it with your friends and family? Become an affiliate and see how simple it is to make money while sharing a service you use and love! Case Lot Deals at Smiths–BIG Savings!